Inquiring or searching for answers regarding your SSS? 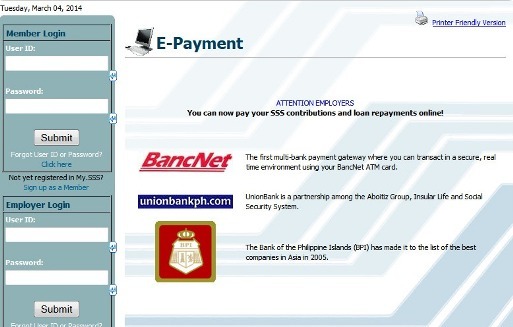 Specific details about your Social Security System Philippines member account made available via online inquiry for Pinoys to take advantage of. Our family had a lot of personal experiences and knowhow regarding social security and other Philippines government matters which we'd like to share here. We will discuss about the social security Philippines branches, membership, online inquiry, ID and loan application and a lot of how to guides to help Filipinos have an easier way if not the easiest while going through the different processes and falling in line for your account needs. We will be updating you with the latest news here regarding this service of the Philippine government whenever there is something important going on about social security. To download a form, visit a nearby office to inquire, apply for an ID or check your contribution or log in to your account, just click the link above for tips. A good example to this is the availability of branches abroad for OFWs so they can make an inquiry in the country where they work, permanently reside, have migrated or even for those who are looking forward to go abroad. Your loan application matters should be handled right. Contributions and loan payments are to be made ONLY to allowed and duly authorized / accredited payment centers and banks. You can find more information above. We offer different free forms for members to download here at My Pilipinas.Com. To find a particular form, please click the link listed above with corresponding label. Having problems with your amortization or monthly / quarterly or yearly member contributions and loan payments? Navigate to the specific link above to find more tips and guides from our family's experience. Below is the SSS table for salary bracket / monthly salary credits, range of contribution and total number of contributions taken from scribd upload. Here are the different authorized payment centers where you can pay for your remittance or member contribution premium and loan payment. Here is also where you can make an inquiry regarding payment schedule although basically, from my father's experience, contributions may be set at a payment term of monthly, quarterly and yearly basis. So it's actually the member's choice which is which when we talk about paying your contribution but I strongly suggest that if and should you decide to pay quarterly basis, you should be able to decide if you can maintain it and know that you can pay for it to avoid any inconvenience and changes in your account status. Today, a missed payment is no longer allowed to be paid late and this can cause a member account to go inactive. Inactivity or dormant account are subject to many penalties like when you want to apply for a loan. Online inquiry system for your social security member account is a must for many. Apart from the convenience that it offers to the member, the time saved is the most important especially if you are a working member. For non-working or self-paying / voluntary contribution active paying members, it holds the same usability feature. If you are interested to register for an account online, all you will need is an email address and you're good to go.